We're lucky to be surrounded by such cultural richness in New York City; it sure does afford us some exciting field trip opportunities. Nevertheless, our teachers often wish they could snap their fingers and walk through the Amazon with their students to bring to life the different ecosystems they study in science, or actually visit the famous Chinese landmarks they often talk about in Mandarin. 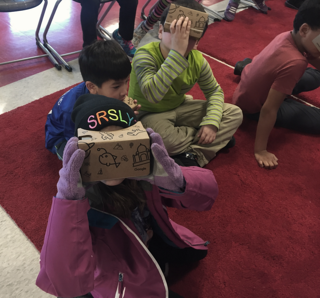 Thanks to the Google Expeditions Pioneer Program, a virtual reality (VR) technology offering "guided tours of places buses can't go," teachers don't necessarily snap their fingers to walk through the Amazon, but rather snap a few pieces of cardboard in place to create a viewfinder around a simple virtual reality device to go literally quite anywhere in the world. Bethanie Baynes, proud mom to Reid (3rd grade) and Director of New Business Development at Google, brought the Expeditions Pioneer Program to BASIS Independent students in both elementary and middle grades, helping them explore Slovakian caves, the Galapagos Islands, the Moon, Egypt, Greece & Rome, Middle Ages & Renaissance Architecture, the Amazon, and Jiuzhaigou National Park. 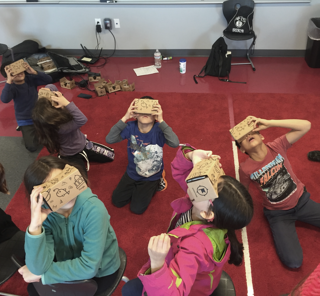 Third Grade Learning Expert Teacher (LET) Mr. Brian Bissinger led the charge on orchestrating the visit of Google Expeditions to our classrooms, recognizing that it was a "fantastic opportunity to connect what they were learning to real life." It's clear how VR can enhance studies in the humanities, arts, and sciences, but what we didn't quite expect was it's application in foreign language curriculum. Kafele Kossally, Mandarin teacher, artfully explains, "In a language classroom, the target culture can seem entirely abstract; it is sometimes hard for students to understand the cultural context of the language that they are learning. Understanding that context is essential to mastering a foreign language. 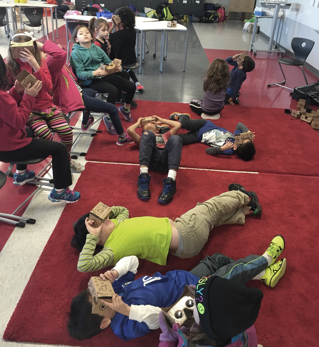 Using the Google Expeditions to visit a national park in western China gave students a glimpse into the natural and cultural environment in which Chinese is used. Students were able to visit normally inaccessible locations and enjoy sights that few Chinese – let alone American school children – are able to see. They learned about the famous natural formations within Jiuzhaigou National Park and some of the history of the villages of ethnic minorities who live in the region. Even more valuable, students came away from the experience with bright memories of what they saw and eager questions about what they experienced. The Expedition piqued students’ interest in the target culture, which is an indispensable resource for any foreign language teacher." 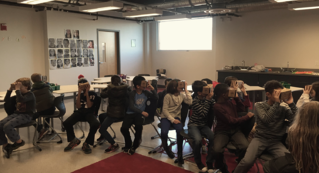 After letting the students spend some time free-exploring at the beginning of each session, it became apparent that the engagement made possible by Google Expeditions goes beyond bringing to life curricular material. The 3rd graders' exploration of Greek ruins and architecture (tied to their study of Ancient Greece in Humanities) generated a lot of larger questions about technology through the ages. "Students asked some big questions about what kind of technology was around back in 845 B.C. and were curious if what they were looking at was recorded in real time. Needless to say, we had to have some talks about the feasibility of time travel." In this video, 3rd grader Miriam tells us what she enjoyed about her experience. Alexandra Hancock (AH): Tell me a little bit about how Google Expeditions came to light. Bethanie Baynes (BB): Expeditions is a virtual reality platform built for the classroom. We worked with teachers and content partners from around the world to create more than 100 engaging journeys - making it easy to immerse students in entirely new experiences. Why did you bring it to BASIS Independent Brooklyn? I had experienced a brief intro to the technology and knew my son would get a kick out of it. Then when I learned about the initiatives we were running with schools around the globe, I knew I wanted to get our BASIS Independent community involved to help bring what the students were learning to life. What do you see as the added value of VR to a student’s education experience? It helps students to correlate what they're learning to real world applications and experiences. It's hard as a child to realize when you'll use math, geography, language, biology...sometimes it's even hard to recognize as adults! This is an opportunity for kids to solidify what they're learning, but also to gain a sense of adventure and inquisitiveness for the world beyond. Do you have a favorite moment or a story to share of the kids using VR? The best part was each time the kids first saw a scene and would spend the next 1-2 minutes screeching in excitement; this happened in every class and with each new screen the teachers guided the students to. My favorite story, however, was the first class with 3rd Grade (Carbon section). Before we even got started a little boy came up and asked me if I was Reid's mom. When I said yes, he gave me a big hug and said "thank you, I've always wanted to do this!" It was a wonderful experience for me as well as the students and teachers. It really made me proud of the technology Google is developing to further our company's mission of organizing the world's information and making it universally accessible and useful. Additionally, I was very proud of our BASIS Independent community for welcoming this experience with such enthusiasm and support. It was a great day all around! Tech Crunch's January 23 article, "When Virtual Reality Meets Education" does a nice job explaining how virtual reality has begun to take hold in education and some of it . VR is on the rise in an array of industries, expanding its reach beyond the gaming industry, where it historically has enjoyed most of its success. We will certainly be keeping an eye on the evolution of VR in education. Could this virtual field trip technology be an innovation with staying-power in classrooms around the world?